Thanks to the advancement of technology, there has been an increase in the number of gaming platforms that are available throughout the world. This also led to the growth of platforms such as Azubu TV which provide premium eSports actin, news and programming. Azubu provides high definition content from major tournaments, teams and players across a wide range of devices. Since watching Azubu content is dependent on having a good internet connection, a low internet connection can make viewing live streaming content very frustrating since the content will have to keep on loading. One can however rectify this by downloading videos from Azubu. Since Azubu does not provide a way through which you can download Azubu videos through their platform, the only way this can happen is by using third party platforms. Below is an easy way for you to download videos from Azubu for free. iTube Studio is a must have software for any individual who wants to enjoy their premium video content from Azubu without having to rely on a strong internet connection. iTube studio for mac comes with a number of sleek features that enable you to carry out a number of tasks all from the convenience of your computer. Download videos from a wide number of websites including YouTube, Facebook, Lynda, Vimeo and Hulu. Not only does it allow you to download streaming videos but it also accelerates download speeds. Directly download and convert YouTube videos to Mp3. You also have the option to export audio files from YouTube to iTunes automatically. Save and download full playlists and channels from websites such as Lynda, YouTube with the click of a single button. 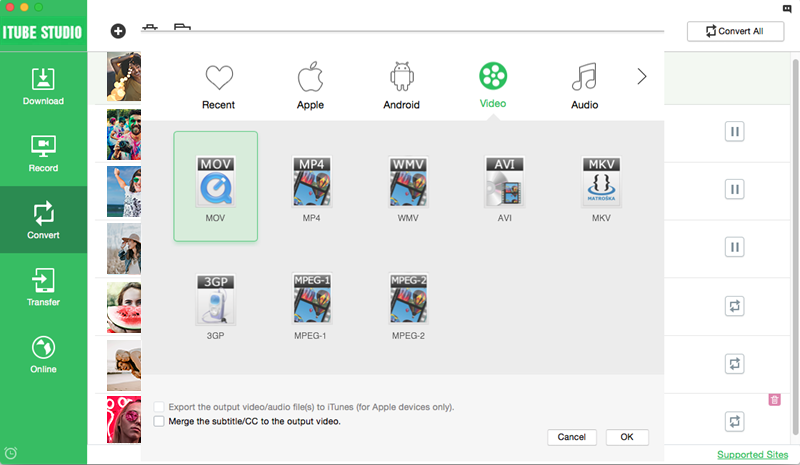 Convert downloaded videos into various formats such as MOV, AVI, MP4, MKV, WMV and FLV. Ater download and install the iSkysoft Azubu downloader for Mac, launch the program. This program makes download of videos from Azubu very easy. You can use either one of two ways to download Azubu videos onto your Mac, that is either through the Download button method or the URL method. For the URL method, one has to launch Safari, Firefox, chrome or any other web browser of your choice. Watch the Azubu video of your choice and copy the video’s URL from the address bar. Go to iTube Studio’s primary window, click on the "Paste URL" button. This action will immediately capture the video and start downloading it. Alternatively you could select the video’s URL and drag it to the iTube Studio Mac dock icon on the address bar. This action will prompt the download wizard to download your Azubu video.